Someone wrote to me today to let me know that they’d received a copy of the book from Parallax. I was surprised, since the release date is Nov 6. Hopefully this means I’ll have a copy in my hands soon. Yes, I got mine yesterday!!! I had forgotten that the pub date was further down the line: now I feel quite special. I got mine the other day too. Pleasant surprise! Though it’s much smaller than I had assumed it would be. Yes, I believe it was the Buddha who first said that. 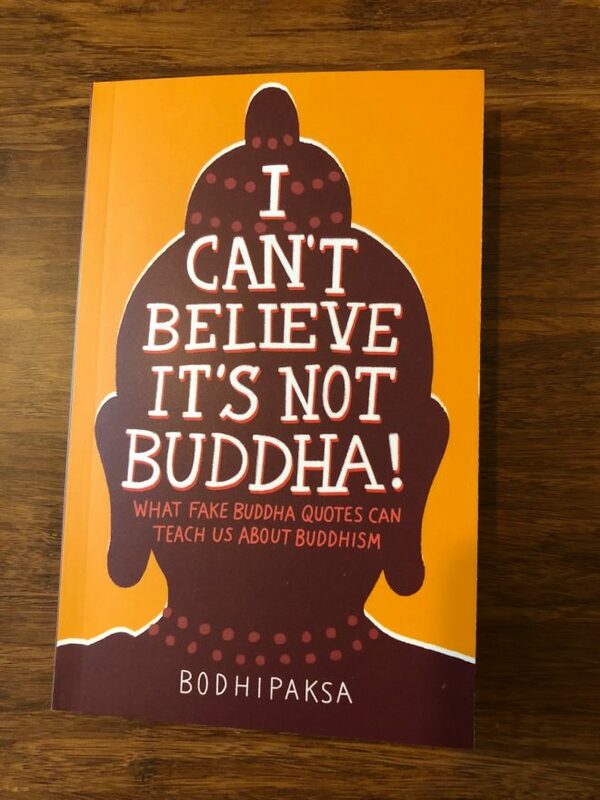 😀 Actually that’s an idea for the next book: modern proverbs that the Buddha anticipated! Have had my copies in hand for two weeks, now. Already, they grow dog-eared from use and reuse! Consise in size, yet expansive in readability, ICBINB has found a place in my daily routine. Thank you, for your efforts in bringing this gem forth! I am not Buddhist and really have no interest in Buddhism, but I had a question and thought you might be the guy to answer it. Do you worry about all this talk of “meditation” and “mindfulness” in pop culture America? I have some former friends who, in my view, really went off the deep end with it. These 2 particular men were not achieving the results they wanted in life and they insisted that meditation was leading them towards their business goals, but it was, in my view, leading them away. I know this is an incredibly unspecific comment I am making… You dont know any background, but could you comment on the rise of what appears to some of us as an unhealthy practice b/c practitioners may use meditation to avoid responsibility or to hide from life’s challenges and realities? It’s certainly possible to use meditation to avoid responsibility, but whether that’s the case with your former friends I just can’t say. I don’t think it’s particularly common for people to do this. I mean, I suppose some people use physical exercise as a way of avoiding responsibility and of hiding from life’s challenges, but on the whole exercising is a natural and helpful thing to do. My experience is that meditation and mindfulness practice are, similarly, helpful for the vast majority of people and help them to be more responsible and better able to handle challenges. On the whole I’m pleased by the current interest in mindfulness. It’s a rather narrow focus given that mindfulness is only one part of a broader spiritual training program, and although it’s helpful it would be more beneficial if people took up complimentary practices such as lovingkindness/compassion meditation, spiritual friendship, ethics, and so on. But it’s a start. Previous Previous post: The excitement is building!